My mom, who has always watched CSI and its spinoffs ('cept she's given up on Miami) says that she likes that actor and the show still. She keeps refusing to believe that the show is going to be cancelled soon - replacing the main character rarely ever works. Exactly. It almost never works. Does anybody know about a show getting a new main character and surviving with the same success? But that show is weird cuz it has, literally, two male leads of equal standing. See? 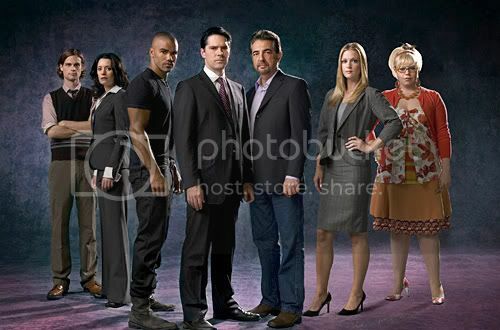 Hotch and Rossi (the replacement Gideon) are given the same position/status. It's cuz they have the team leader type (Hotch) and the old guy with a lot of experience (Rossi/Gideon). Rossi and Gideon aren't the leaders for various reasons - Gideon had some sorta breakdown before the series started and Rossi left the BAU ages ago to write books on serial killers. But he came back for VENGEANCE. Shoot... I don't watch CM. And I know I'd like it. It's a gooder. I like it cuz there is absolutely no shipping in the show. It's fascinating. Well, there's shipping but no canon ships, y'know? Unless you think that Garcia and Morgan actually are flirting for reals and not just cuz that's how their friendship works. Which I don't cuz Garcia flirts with everyone. AND has had a boyfriend for quite some time now. Oh, yeah, and those serial killers are awesome too. Apparently other shows feel that CBS does not do enough to promote their show. I read today in the Chicago Tribune that David McCallum from NCIS said that "NCIS is the little engine " that could despite his belief that CBS hasn't done much to promote the show. He said " we never had a feeling that they were throwing everything they could to make us more of a success". "We did it on our own with sheet guts and hard work". NCIS has held it's own against American Idol with an average of 19mil viewers. The show is great, yet they are never nominated for an emmy. Eh, Emmys are stupid to the max anyway. I propose that all awards shows be eliminated. Mah, but I like the Acadamies...... Particularly several years ago, the first time I watched them, when Return of the King swept the Awards with eleven wins. That I liked. It is all so hokey and lame, though. I just really dislike awards things. It's a psychology study... I like looking at the people in the audience interacting and reacting. æthre wrote: Eh, Emmys are stupid to the max anyway. I propose that all awards shows be eliminated. aethre, you always miss the point of my comments. We're discussing CBS' lack of promoting their shows and all you continue to say is that " you don't like award shows." (duh) This lack of promotion on CBS' part is what caused EH to be cancelled. There is a pattern here of CBS not supoorting their shows which ultimately leads to their cancellation. Maybe we could use this (I don't know how at this time) to help in our efforts to get EH back. The CBS doesn't advertise their shows is something we all know and I didn't feel like commenting on, XD The only thing I felt necessary to talk about is that a show not being nominated for an Emmy shouldn't be a concern because they're rigged and hokey anyway. Does anyone know how Miami Medical is doing...I never see it in the ratings. I know it just got started though.